According to El Cantar, before leaving for exile, el Cid left Jimena and her daughters, Doña Elvira and Doña Sol (whose real names were María and Cristina) in the care of the abbot of San Pedro de Cardeña's monastery. Historically, it was the place where the remains of El Cid and his wife Jimena rested for centuries. The monastery was founded by the Benedictines in 899, becoming an important cultural and spiritual center, especially in the early stages of the construction of Castile. From the Romanesque monastery, plundered in 953 by the army of Abderramán III, remains the old tower from the XI century and the Romanesque cloister, from the XII-XIII century. 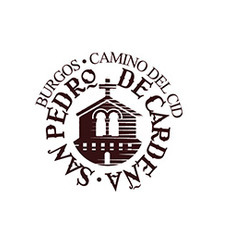 San Pedro de Cardeña has a turbulent history: from its foundation in the once wild landscapes of early Castile, was plundered on several occasions - either by Andalusian armies or by French troops in the 19th century. In the year 1836 was abandoned after the confiscation and temporarily occupied by different religious orders; during the Spanish Civil War it was used as a concentration camp for republican prisoners. Finally, on May 1st, 1942, the monastic life was restored by Cistercian monks who came from the monastery of San Isidro de Dueñas (province of Palencia). Due to these avatars the monastery lacks artistic treasures of great value, but nevertheless its walls are in fact a living document of its history, which curious traveler will be able to discover with the help of the monks, always kind and hospitable, observers of the Rule of San Benito. For example, in its austere façade, of Baroque origin, a statue of the Cid can be seen in an attitude very similar to that represented in the images of Santiago Matamoros (Saint James, formerly called the Moorish killer): the damages and flaws observed in the statue are due to the shooting of the French troops during the occupation (19th century, Peninsula War). The French looting also affected the tomb of el Cid: the skeletal remains were scattered throughout the temple and even stolen by the soldiers who saw in them a valuable souvenir. This is the reason why nowadays some European museums claim to keep the bones of the Castilian knight. The story of the corpse of el Cid was as risky as his life: died in Valencia, his body was exhumed by Jimena shortly before the Almoravid conquest of the city, in 1102, to be buried over the years in the monastery, where he was exhumed several times until his final location in the chapel-pantheon of El Cid, which can be visited. In the chapel you can see the sarcophagi of El Cid and Doña Jimena: sculpted in the 12th century by order of king Alfonso X el Sabio (the Wise), a distant descendant of Rodrigo, they still preserve small remains of polychromy. Also you can see cenotaphs of their relatives and friends, as well as various frescoes and objects of the time. Today the remains of Cid and his wife are buried under the cruise of the Cathedral of Burgos. From the fifteenth century abbey church, where the chapel is located, we access to the cloister of Romanesque origin. It is called "of the Holy Martyrs" because it is identified with the place where, according to tradition, 200 monks were killed by the Andalusian muslim troops of Abderramán III. The original capitals are carved in red sandstone and decorated with plant motifs. The tower in Romanesque style of the early eleventh century, is popularly called "Doña Jimena's tower" due to the verses of the Cantar, which placed in Cardeña, during the exile of el Cid, temporary refuge to his wife and daughters. Nowadays the monastery of San Pedro de Cardeña is considered the epicenter of the cidian world, a place of history and also of legends, such as Babieca's: on the way out, a monolith marks the place where, according to tradition, the horse of El Cid was buried. In 1949 the Duke of Alba carried out an archaeological excavation there, without result. After finishing the visit you can buy in the monastery, as a curious souvenir, a bottle of Tizona, a digestive liqueur between 38 and 40 degrees of alcohol, with a peculiar flavor not always to everyone's taste, prepared by the monks themselves with native herbs. The less adventurous can choose the Valdevegón, the wine that monks age in the barrels of their ancient cellar.